One of the five panels with the first pass of the sky laid in. It's been a very long time since my last post, but I've had a lot going on. The bulk of my time has been spent doing photography of some new items I picked up on ebay. I've shot close to a thousand photos, which will eventually be whittled down to around thirty images that are deemed paintworthy. I've culled out most of the chosen, and am looking forward to getting them onto canvas, but they'll have to wait a bit longer because I've picked up a big commission with very short time frame. The five panels ready to begin the aircraft component. 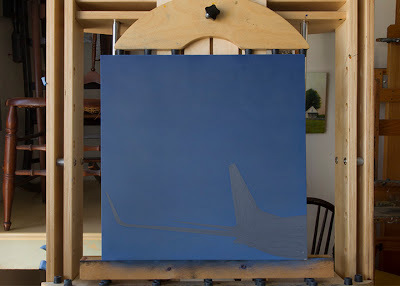 I'll be doing five 16 x 16 paintings for the new Delta Sky Club at JFK. The subject will be various aircraft views (oh boy). My work will be presented on a wall comprised of seven wood panels. 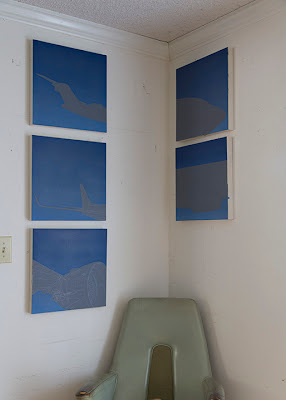 One painting will be centered in each of the five middle panels. I've done the photography, picked my favorites, had them approved, transferred the drawings and got the first layer of the sky painted into each panel. Now it's time to begin working on the actual aircraft. This commission has to be done very quickly but I may post "in progress" shots. It all depends on how it goes. 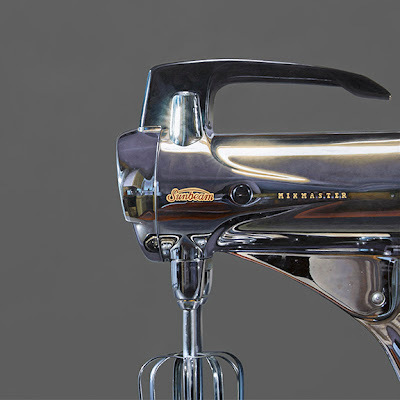 Well, it took more than a few days to finish up the mixer. It took nine more days to be exact. Some days I'd cover a lot of ground and on others I'd spend the entire day working on a section about 3 inches square. It was a fun painting, and honestly I wasn't in a hurry to be done with it. I think I'll flip it around and paint the other side one day. The opposite side is a little different with a cool cap on the end of the body. When this has dried and been varnished I'll be sending it up to Rehs Galleries Inc in New York. My wife Karen and I will be sharing the spotlight this fall in a two person show at Tree's Place Gallery. I'm looking forward to doing a show together again. I plan to have some of my standards, but I've also been busy scouring ebay for cool props, and have acquired a bunch of new stuff to paint. I hope some/all of them prove to be popular subjects. I'll be spending the next week or so working on photography, so I won't be posting much to Blogger or FaceBook. See you when I get back to my easel.